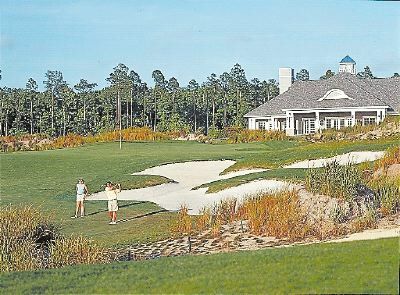 North Hampton Golf & Country Club community in Amelia Island, Florida. North Hampton is a golf community located along the banks of Lofton Creek, just west of Amelia Island. Set amid acres of idyllic natural areas, North Hampton is a perfect combination of neighborhood and nature preserve, a place where family adventures abound. The community is just minutes from scenic Amelia Island and historic Fernandina Beach, and an easy drive to downtown Jacksonville and Jacksonville International Airport. Affordable homes, abundant employment opportunities, good schools, the beaches and numerous recreational opportunities make North Hampton a great place to live. North Hampton community boasts beautiful home sites, an 18-hole Arnold Palmer Signature design golf course with clubhouse, Aquatic center with adult's Junior Olympic and children's swimming pools, park with children's recreation area and play ground, tennis and basketball courts, multi-purpose playing fields for soccer, baseball or football, waterfront park and outposts. Developer is Landmar Group and builders are Watson Custom Home Builders, Arthur Ruthenburg and ICI Homes. Purchase of a new property includes a Full Golf Membership to North Hampton and reciprocal privileges at 16 clubs throughout Florida and the U.S.